An artwork might intuitively seem like an object more likely to be found in an archive than to constitute an archive in its own right. But if we recall Jorge Luis Borges’ Aleph – the object or “point in space” that opens out to reveal a whole universe – we can begin to see how a work of art can behave like an archive. This is less abstract than it might sound. 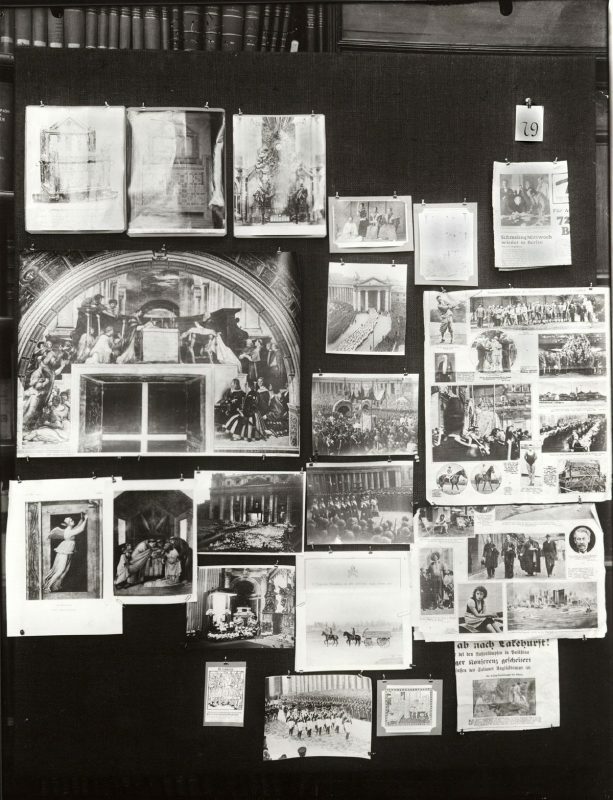 Aby Warburg, for example, was inspired by the idea of artworks as partial cultural archives that could be wrenched from their historical eras and reassembled to form a new way of visual knowing. He called the resulting panels Mnemosyne Atlas, though the project remained unfinished at his death. Figure 1. The artwork as document. Panel from Any Warburg’s Mnemosyne Atlas, an unfinished, thematic and aggressively anachronistic art historical project, now reconstructed in a fascinating website hosted by Cornell University. Figure 2. The artwork as information. 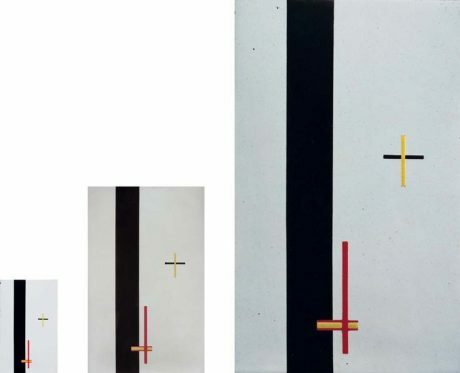 Laszlo Moholy-Nagy, Constructions in Enamel I, II and III, 1923. Identical works at different scales, purportedly made by an enamel factory which had received the specifications over the telephone. And, as can be seen elsewhere in this issue, archives can also form the material for more ambitious (and playful) classificatory experiments (Hess, de Croehling, Prévieux). Figure 3. The artwork as repository. 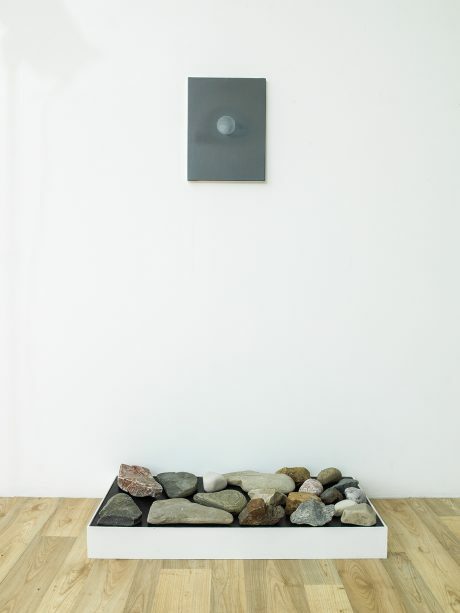 Fabienne Hess, Hits and Misses (Talbot Rice Gallery, Edinburgh 2015). The work is a fabric showing every available image from the University of Edinburgh’s digital archive. 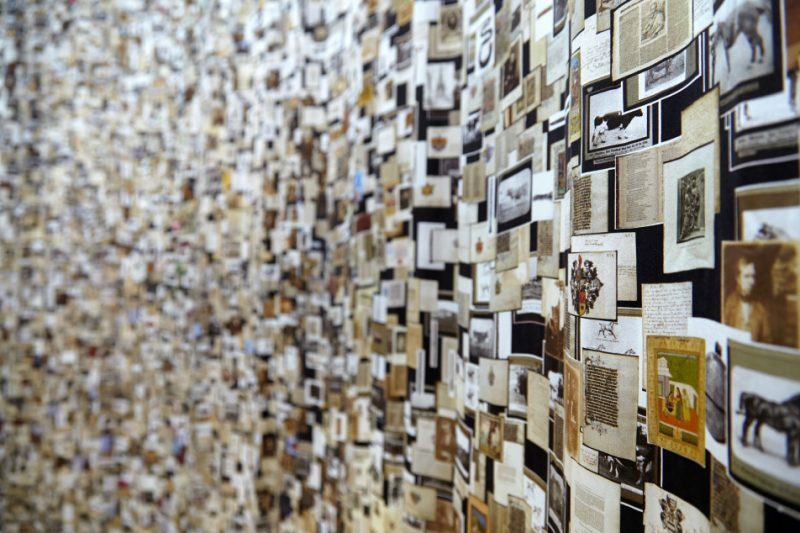 A total archive is of course literally impossible, but in imaginative literature, there are two ways to achieve it, as Borges has taught us: infinite expansion (“The Library of Babel”), and infinite compression (“The Aleph”). Apparent opposites, the two cycle continuously into and through one another, as do outside/inside in a Möbius strip or interior/exterior in a Klein bottle. Likewise, where the artwork expands most fully it also becomes the most constrained, resistant to explanations that break apart the contradictions in the work. Relics are like this: they are either legitimate, sacred, non-made instantiations of the past alive in the present, or they are artificial, profane objects that tell stories of their non-miraculous provenance. We want them to be both, but they can’t be. Forgeries have this quality too. They are overburdened with historical meaning and therefore appear to have none. Hayles calls the system that constrains a “total archive” an apparatus of control – again this sounds abstract but she is referring to quite concrete administrative systems: governments, corporations, universities. Interpretative inflexibility tips over into institutional control. So archival artworks can build worlds, and they can also wield authority, demanding much more than simply to be looked at or considered. We are on the outside, and they invite us in. The London-based artist collective “UA” repeats a “Universal Hymn” at each of the group’s meetings. The hymn was “composed” by electronic music pioneer Peter Zinovieff, who gave the group the instruction to say/sing the letter A in any pitch, at any volume, in any pronunciation, for any duration: “Universal Hymn is A.” And he might have added: “Universal Hymn is Always A”, because, following the logic of ritual, any utterance of it is authentic. A work like the Universal Hymn is always the same piece, across all performances, but it doesn’t rely on any idea of an original which can be copied. The Hymn is a minimal auto-archive, an Aleph. And it opens out into… whatever comes after – Live Action Role Play, collaborative sculpture, performance, song, poetry. So the Hymn is a social technology, like all good ritual. 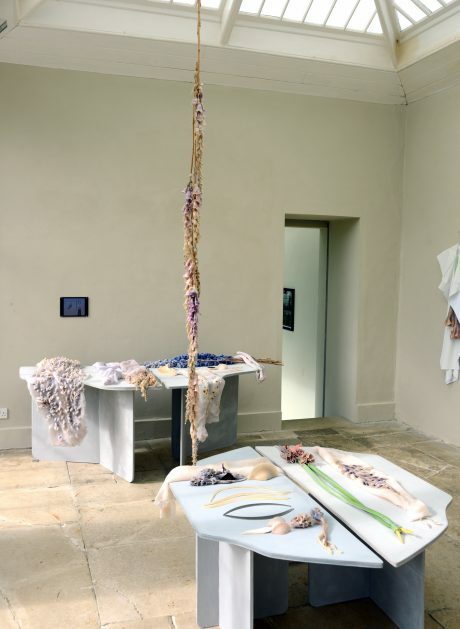 For example UA member Miriam Austin’s installations and performances are always already old – pristine, but only because they have been maintained in such good order, practiced with such care. The archival function of these works is precisely that they conjure a totality: some objects are familiar. Figure 4. Miriam Austin, Prosthetics for Hostile Contexts (2015). 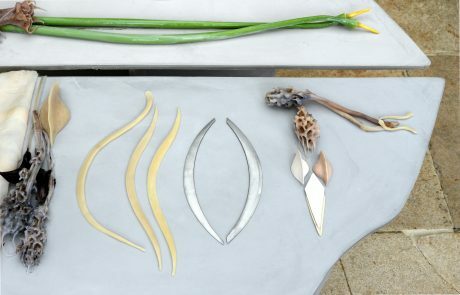 Part of the exhibition “Groundwork,” at the New Art Centre, Roche Court, Salisbury. But the flowers are not quite natural, glistening but dry – apparently preserved in rubber. The knives have no handles and on inspection look more like the clavicles of an extinct metallic creature. The tables on which objects rest are split down the centre, creating a gap down which substances slide. Precision here is unnerving, imprecise. The absolute authenticity of ritual is grafted onto an unreal world in just the way authors use small “real” details in magical realism. The work is a world through which you can walk, and it opens out endlessly as a space of imagined vigilance, order, meaning. Figure 5. Miriam Austin, Prosthetics for Hostile Contexts (detail). Another UA member, Anna Hughes, makes work that is superficially similar, but intentionally less comprehensive in the world it creates. Here the exertion of a strange order brings us closer to the minute perfectibility of the Aleph than the grandeur of the Library. If enough force is applied to the arrangement of natural detritus it will cohere into a taxonomic singularity. Figure 7. Anna Hughes, Looped Among Islands (detail). This is the straightforwardly historical element of Hayles’ idea of infinite compression/expansion: classifications require raw data, but data, as any historian or sociologist will tell you, is always cooked (Gitelman, 2013). This has not been a problem for the architects of archives – far from it. The presence of classification in data has motivated the most ambitious of all projects, from the archive of all human happiness (Jardine, this issue) and of all human movement (Laemmli, this issue) to the composition of the great encyclopaedias. As Simon Schaffer has pointed out, the Enlightenment encyclopaedists, in recognizing the multitude of possible “projections” on which their maps of knowledge could be based, still worked at “collecting knowledge into the smallest area possible and of placing the philosopher at a vantage point high above this vast labyrinth (Schaffer, forthcoming).” Universal because particular, a paradox that again pushes us to situate the artwork in a world, not just of ritual action but of half-reasoned order. The terms are indexical, in both the paratextual and linguistic sense: insofar as they fail to interrelate, they have to point elsewhere, to some other state of affairs, a location in the book of the natural and technological world. This is the assertion of an intuitive order onto an overwhelming slew of information. 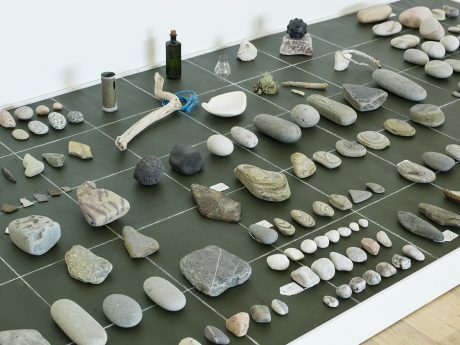 Jones’ intuition, however, is not formal but ecological: the juxtaposed phrases, titles and imagery range over the natural and the personal, the machinic and political. We have the materials for salvage, they seem to say, so let’s use them. The final archival meaning of a work is that it can be an “ark”, just like the first (and presumably last) museums. The impersonality of Jones’ writing is not a hopeless gesture to a world after humans or a non-human ontology, rather it acts to distribute authority equally amongst its component parts (the ark itself, of course, was built to a sacred design). Gitelman, Lisa (ed.). 2013. Raw Data is an Oxymoron. Cambridge, MA: MIT Press, 2013. Schaffer, Simon. forthcoming. “Afterword,” Re-Visioning the World: Myths of Universal Knowledge and the Aesthetics of Global Imaging.